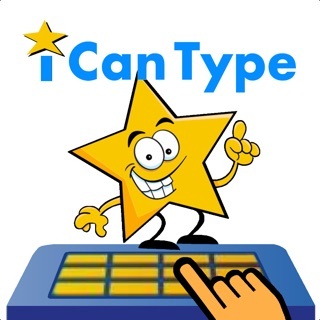 Easy to use – Top quality recorded speech – Educationally sound – It gets results! 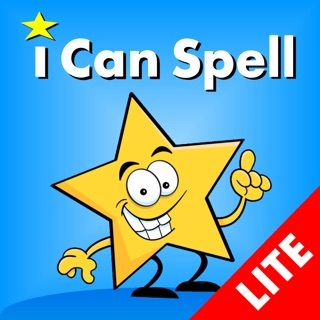 Teaches 150 sight words with regular spelling. Breaks words into "phonic chunks" and sounds them out. Words are taught in meaningful sentence context with vibrant photos. It's like training wheels for spelling success! Ages 5 to 7, plus Remedial, ESL and Special Needs. 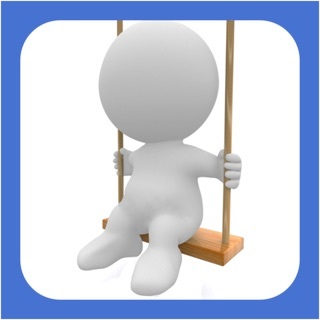 Designed for children to use independently – Hours of learning fun. 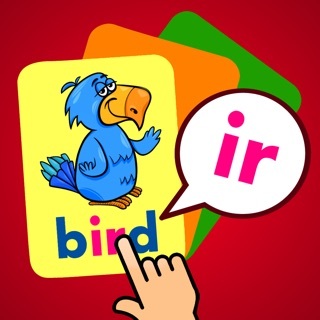 Begin learning two letter words, CVCs, short vowel sounds and simple rimes, before moving on to consonant blends, common digraphs, including: sh, ch, th, ck, oo, ee, ow, ou, ay, ai, oa, and r-controlled vowels: ar, ir, or, er. Simply tap "PLAY" and pick one of the five words to start (from easy to hard). Or pick a word list from 1 to 15, CVC words, a short vowel or digraph, or pick your own "My Words" list. 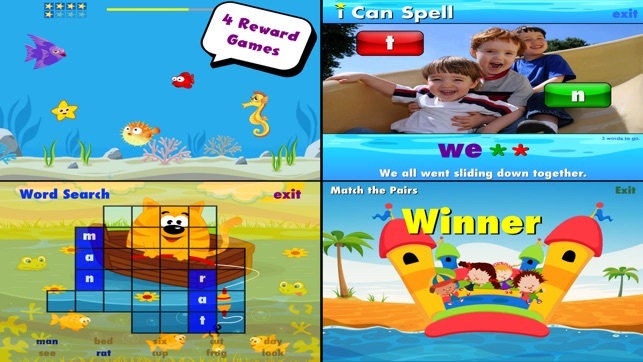 Each 10-word-lesson is made up of three activities, followed by a reward game. 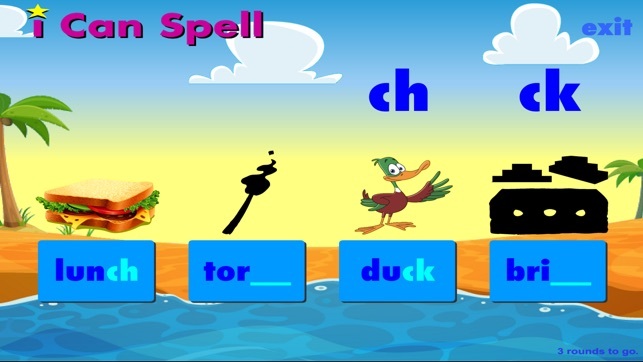 Activity 1: Tap on the "phonic chunks" to build and sound-out each spelling word. Activity 3: More "phonic chunks", but this time the spelling words are put in context, with engaging sentences and vibrant photographs. Reward Game: Choose between "Match the Pairs", "Word Search", "Fish Food" and "Space Rescue". NO ADS – NO IN-APP PURCHASES – NO WORRIES! All links and app settings are placed behind a parental gate. 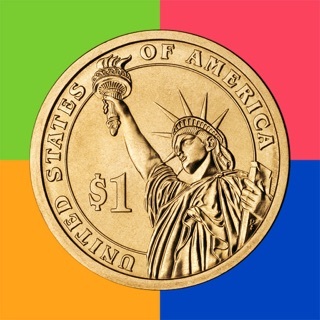 TEACHERS: If you find the reward arcade games too distracting for your classroom, these may be turned off (in "Settings"), enabling students to play word games only. Please visit our developer website (link found at the bottom of this page) to view videos, get the app guide, and free worksheets! 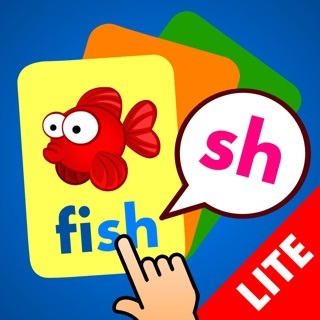 Our apps systematically break words into phonemes and sound them out. The whole word and phonics are presented together. Neither is given priority, because the phonemic and visual aspects are BOTH important when learning to read and spell. 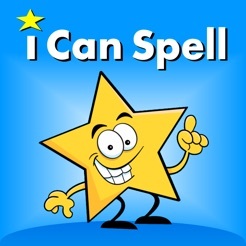 i Can Spell with Phonics teaches spelling through immersion and repeated exposure both visually to the correct spelling, as well as hearing and actively sounding out the words. Phonics is taught explicitly, and the words are also placed in meaningful sentence context. 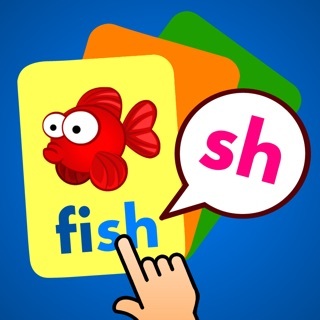 The words included are phonemically regular sight words, however the vocabulary is not limited to the extent required by most "synthetic phonics" programs, which tend to dictate a specific order in which to introduce phonemes. If required, teachers can pick their own words for the lesson using "My Words" (words must be chosen from the 150). We use a traditional pronunciation of "w" and "y" ("wuh" and "yuh"). 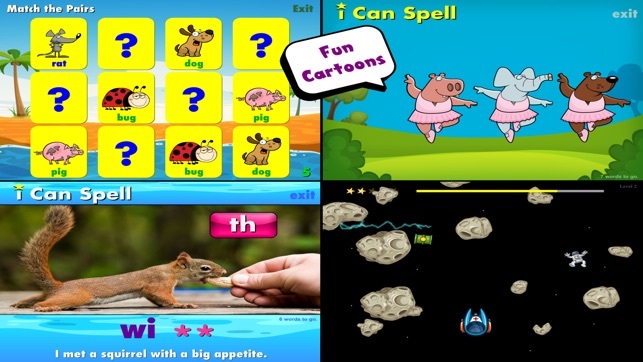 Our apps are designed to be highly educational, fun to play, and also take into consideration the needs of struggling literacy learners. 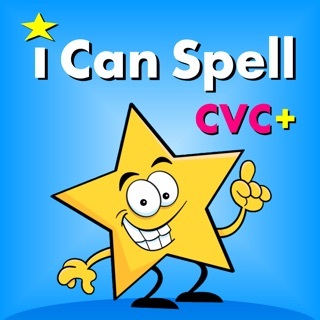 Whether you are buying this app for your four year old who has already mastered the sounds of the alphabet, or for your eight year old who still struggles to read, i Can Spell with Phonics will provide them with intensive phonics practice which is easy, fun and effective. It's a good education app. It's well designed with loads of content and motivational reward games, which keeps my children playing this app over and over again. I highly recommend to any mums and dads who want to give their kids an educational head-start. As a teacher I high recommend it - it's easy to use and educationally sound.